Delpro’s powered flotation dryer presents a new dimension of efficiency and sensitivity in the drying and curing of printed or coated continuous web materials. Developed in conjunction with the fluid dynamics department of Leeds University, using computer flow modelling and experimentation, the flotation nozzles are designed to provide the perfect balance between efficient heat transfer and web stability. Temperature, air velocity and humidity are independently controllable from zero to maximum in the top and bottom section set of each module. 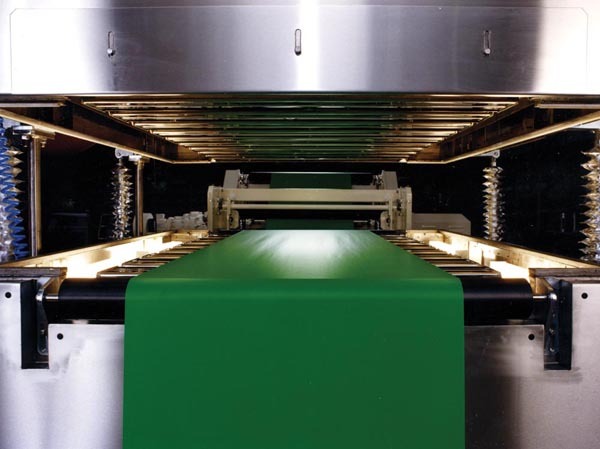 If required, the web is supported and heated from the under side only for the initial drying of coatings sensitive to "skinning" or solvent entrapment. Maximum heat and air can be applied to emulsion based coatings immediately after application to minimise migration and print mottle. Exhaust air volume is controllable to dew point or solvent burden (LEL) for maximum efficiency and economic solvent recovery or incineration.